Good dental health has an impact on the entire health of your dog. Just like in humans, if a dog’s teeth and gums aren’t kept in good condition, they can succumb to a range of medical problems starting from bad breath, gingivitis and periodontal disease, and potentially leading to kidney and other organ illnesses due to inflammation and toxins being spread to other parts of the body. Needless to say, keeping on top of your dog’s oral health is so important. Raw bones are of course an excellent thing to provide regularly. They’re not only delicious for dogs, but encourage vigorous chewing and scraping away of food and plaque from the teeth. Providing raw bones regularly (suitable to the size of your dog) goes a long way in encouraging great mouth health. There are other options as well – dog dental treats. Whether you want to add more variety or just aren’t comfortable in feeding raw bones everyday, these treats provide a less messy and convenient option for encouraging chewing as they have been designed and formulated with oral health in mind; making them different from other treats which are often too small and soft to require much (or any) chewing by most dogs. The best dental treats for dogs will have vitamins and minerals added to help with overall health – for example, to promote good heart, kidney and immune health. I’ve been careful to study each product closely and to avoid any that contain harmful and unhelpful additives and filler ingredients. It has been noted if any products do contain any potentially unhealthy ingredients. Because there are so many products out there, of varying quality (to say the least), I’ve broken this section up into the main different types of chews and treats for dog dental health. Then I cover the best items within each category. A very well known brand, Pedigree Dentastix are clearly very popular amongst dog owners who want a quality, reputable dental treat that is also affordable. Dentastix has been designed and tested to remove the build up of tartar and plaque on the teeth, so that it doesn’t reach a level that causes serious oral health problems. The signature star or X shape of these treats aren’t just there for their looks. This is a design Pedigree has settled on for the purpose of it providing the best contact with your dog’s teeth when he’s chewing on it. It’s recommended that a dog is fed just one Dentastix per day. Some time after the main meal of the day is a good time to give a DentaStix, so it can work to remove any food that has attached to the teeth. These aren’t a treat that a dog can breathe down. They are chewy and have a tough texture, so take a good effort to get through (which is the whole idea behind dental treats). Even the largest dogs can take up to a minute to get through a Large size DentaStix. The Large size Dentastix measure about 5.5″ each in length and about 3/4 of an inch wide. Some people choose to only feed half a stick each day, even for larger dogs. It depends on your dog’s diet, weight, and any other treats he might get during the day. The twist or star shape is a common design for dog dental snacks and these ones are named after it. These have to be one of the most popular treats. Bully Sticks are basic and simple, and that’s what makes them appealing to a lot of us. Like a lot of other dental snacks, they’re made of beef, but in this case the company goes to great lengths to let us know they come from grain-fed and free range cattle. So they come without the added hormones and chemicals that you might find in lower quality beef products. In fact there are no added ingredients at all in these sticks. They contain just the one beef ingredient and that’s it. This gives them a high protein count of over 70% crude protein. It’s recommended that you limit your dog to one Bully Stick per day. The sticks are meant to provide a chewing challenge that physically scrapes away built up food, tartar and plaque. They come in 2 lengths: 6 inches and 12 inches. If there’s one downside to a meat product being all natural and without any added preservatives, it’s that you’re going to get the meat-like smell. There’s no point saying that Bully Sticks are odorless, because they aren’t. The smell of them isn’t overwhelming (to most people), but it’s noticeable. You will find this is the case with most of the treats available though. I prefer to save them as an outdoor treat. However, there’s also an “odor free” version of Bully Sticks available if it really bothers you, just keep in mind that they aren’t going to be as 100% natural as these original ones. If there’s a common complaint seen about Bully Sticks it’s centered on the variation in appearance of them. They don’t always look like what’s on the packaging. Being a natural product, you expect varying shapes and sizes and this can be seen as a good thing. The less processing the better. But some people are less enthusiastic about the sizes or shapes of the sticks (and rightly so when they’re smaller than expected) they receive so this is something to keep in mind if you’re someone who likes a “perfect” product appearance. In training your dog to reduce excessive barking and other unwanted behaviors, treats are going to be one of your best friends and a vital tool in your arsenal. Practising positive reinforcement training by rewarding your dog when he or she does what you want is of course the best way to get any dog on the path to more favorable behavior. And one of the biggest keys to making rewards based dog training work is to be both consistent and prompt when giving out the reward. In other words, treat your dog immediately following the good behavior. Tasty treats are naturally a highly desirable reward for any dog. They are easy to hold on hand for just the right moment, and you can administer them instantly. This lets you practice good training techniques, while giving your pet a reward that he’ll be grateful to receive. So which doggy treats are the best ones to look at? Take a look at our big guide and reviews below. I’ve carefully gone through a ton of information, reviews, products and all manner of research to build this list. I wanted to avoid the junk (which there’s plenty of out there) and focus on just the best quality canine treats. Let us know what sort of treats your dog loves in the comments! Wild dogs catch and eat small to medium sized animals. The aggressive chewing and abrasive nature of eating a whole animal in the wild, including biting through bone and tough muscle tissue, keeps the teeth in excellent natural health. So how can we replicate some of this at home with pet dogs? Easy – by regularly providing raw bones that are sized suitably for your dog’s breed. Many local butchers sell bones for dogs. Alternatively, some butchers and farmers offer online sales and delivery, depending upon where you live. The best bones will be fresh, and will often have some meat (and yes, blood) on them. 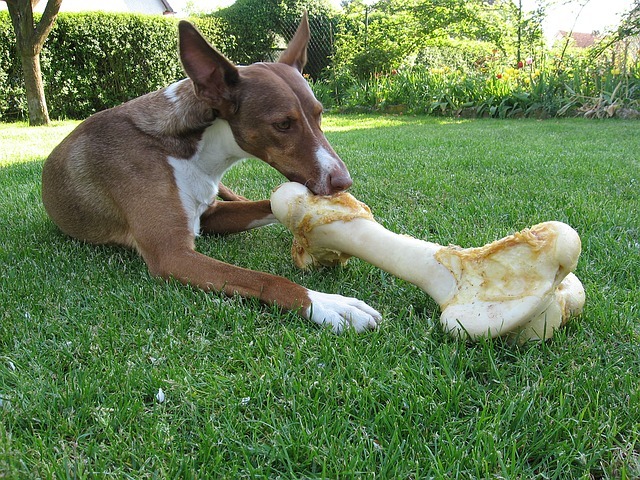 Large bones will keep a lot of dogs busy for a long while – even small dogs can use a larger bone as a chew toy. With that in mind, hygiene must also be considered. A fresh bone can harbor bacteria which multiply, especially in warm conditions. If you notice the bone smelling – remove it from your dog, dispose of it in a bag, and provide a fresh new one. Dried, clean and washed bones are more suitable for longer term use. Many dogs will of course bury their bones and dig them up at a later time. Obviously the biggest dogs will make light work of small bones, so you’ll want to make sure you can get your hands on larger pieces for big breeds – such as cow and sheep leg bones. As most people know (or should know), but always worth mentioning for the sake of safety: only provide raw bones to your dog. Never give a dog cooked bones. These can splinter easily and become a choking hazard, resulting in a risk of serious injury needing urgent medical care, and even death.